After the BIG BIG meal at Kor Kor Jon's place, all of us were feeling rather sleepy. There were a lot of cars on the road. The memories the horrendous traffic jam that we encountered last year was still fresh. It was bumper to bumper kinda jam for dunno how many kilometres. Hence, Papa and Mamarazzi decided to spend a night at Kuantan. Found Hotel Vistana. They have rooms available. Mmm...the room is very clean and comfortable. First thing...."I on the TV ah? Find channel 613 ah?" After a quick shower we heads out again. Spotted the Welcoming Drinks Counter. 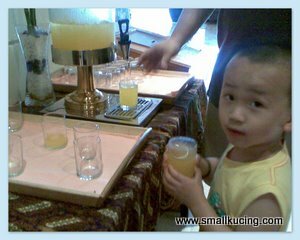 Had a glass of thirst quenching Orange juice. 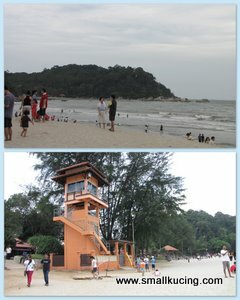 We head on to Teluk Chempedak Beach. Fuiyoh,....here were a bumper to bumper traffic jam from the main road to the beach. 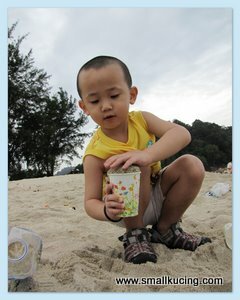 Papa asked Mamarazzi and me to go to the beach first while he look for parking. 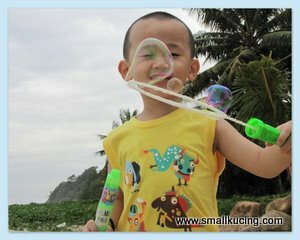 While waiting for Papa, I played with the BIG BIG bubble that Kor Kor Jon's daddy gave me at the house. Uncle Wan and me smuggled this into my pants so that Mamarazzi don't see. If she saw, sure she will say me greedy. Already have Angry Bird Bubble, still wanna take some more. Tak malu. See my BIG BIG bubbles. It was very windy at the beach. I don't have to blow. Mr Wind blew the bubbles for me. Saw some kids building sand castles. Jeng! Jeng! 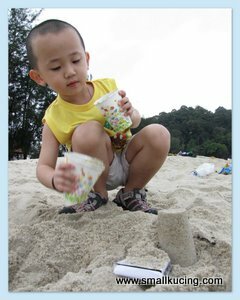 one for me, one for Mamarazzi and one for Papa...oppss....one of the Sand Castle crumbled. Poor Papa ...round and round for more than half an hour still couldn't find parking. 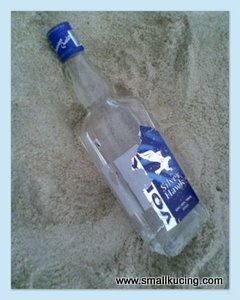 Hmm ...maybe I should take this half bottle of Vodka found at the beach for Papa to drink? People seems to have left a lot of things on the beach. 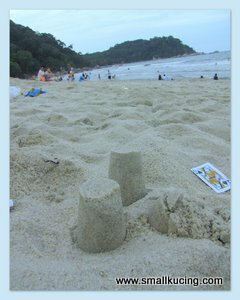 Apart from this half full Vodka, there was a full bottle of Sun Block, some gambling cards, a whole plastic full of unused paper cups (which I used two to build sand castle), mineral water bottles and a whole load of other things. Aiyo...leaving all these junks no use la...next time leave a wad of money for me lah. 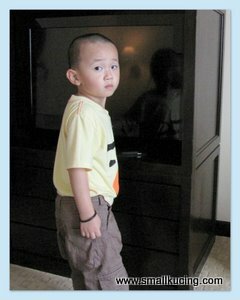 haha yeah leave a treasure for mamarazzi we can split it into 50/50 can ar?? :P look's like the lil boy had so much fun!!! Auntie Little Bird is sitting at one corner and cry. Please dun ask why. *EMO* BOOHOO! Nice! Kucing enjoy making sand castle it seems! Oo i'll be staying over kuantan this weekend for a colleague's wedding. Not sure what is there to play there though .. lol! 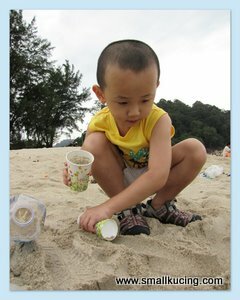 thatswhy i don't like go to out vacation during CNY and rather stay at home, hehehe.. So many unmoral people, simply throw rubbish at the beach! Happy CNY, my dear! Sorry for my long absence, really tied-up over CNY. Looks like you'd a great time with your kid! At his age, this is one of the most precious moments. Love those shots! Long time didn't stay at Vistana liao....there is a food court behind it....very convenient place. Wah shiok are u? Next time take me go ok? Hi Small Kucing. 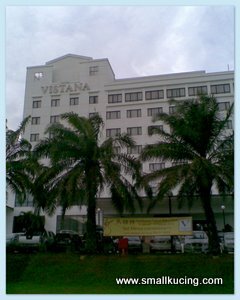 Thanks for this post about your positive stay at Vistana Hotel Kuantan. This hotel is my second home and it's always nice to hear good feedback!